It is alike that of the water; once it manifested into ice, it is hidden by its manifestation. 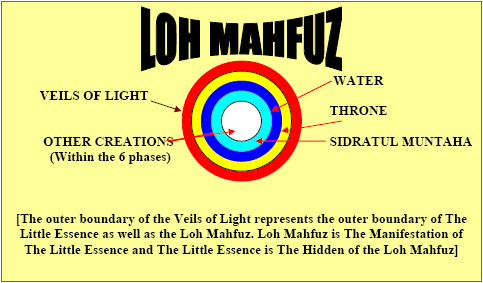 Many are confused as to how the 70 Veils of Light can veil Allah, The Exalted. Hopefully, the diagram below can assist. 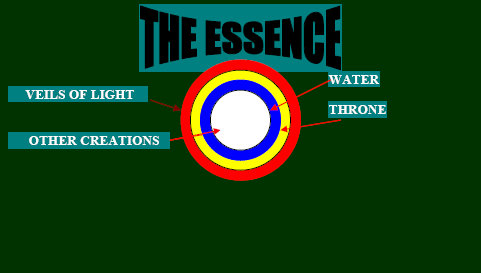 The veiling is actually all around the creations (not The Essence) to protect them from the destructive power of The Essence. Many cannot accept that The Throne can accommodate Allah, The Great. Hopefully the diagram below can enlighten them. 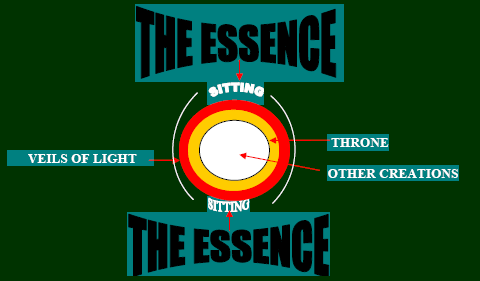 The Essence at the edge of the 70 Veils of Light is as if sitting on the Throne. The Veils are but the cushion on The Throne. We will say that Jack is sitting on a chair notwithstanding there is a cushion beneath his buttock. Similarly, Allah commanded that He sat on The Throne notwithstanding there are the Veils of Light. Many are unable to envisage what Allah meant by His commandment that His Throne is above the water. Hopefully the diagram below can enlighten them. Many could not fathom what Allah meant when He commanded that when all creations including space and time are annihilated that remains is “His Face”. Hopefully, the diagrams below can enlighten them. 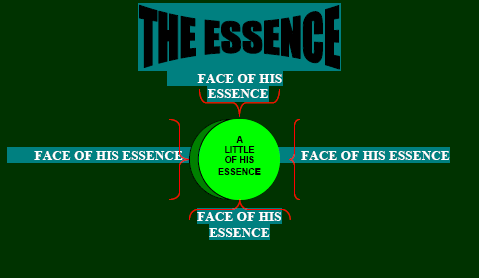 “His Face” referred to by Allah is the face of The Essence at the outer boundary or the edge of The Little Essence (void of all creations). 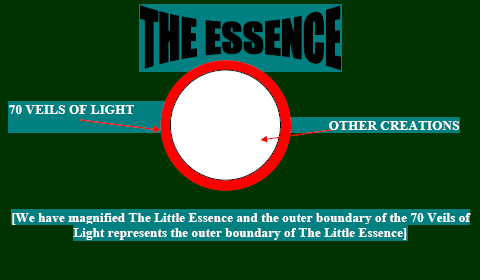 After all creations are annihilated, and before that little portion of His Essence reverted, the edge of that Little portion of The Essence during the transition serves as the “Face” of The Whole Essence. 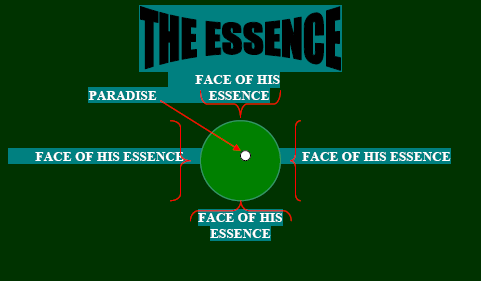 Many cannot fathom the saying of the Holy Prophet (pbuh), hopefully the diagram can enlighten them. 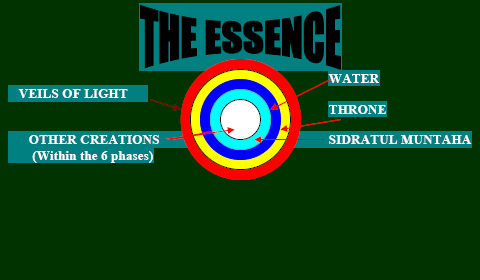 Those in Paradise can see the “Face” of His Essence as clear as the full moon when all other creations are annihilated. 31 Al Baqarah (2):117; Ali Imran (3):47, 59; Al An’aam (6):73; An Nahl (16):40; Maryam (19):35; Yasin (36):80; Ghafir (40):68. 33 Sahih Muslim Book 1, 228 (1994). According to Angel Gabriel, there are 70 Veils of Light and if he nears the 1st Veil, he will be destroyed: Al Hadis (Miskatul Masabih) Vol 4,226 (1994). 34 Al Furqan (25):59; As Sajdah (32):4. 38 When the stars exploded and became oxygen and the oxygen combined with Hydrogen it brought about molecules which we named “water” Scientists had discovered that at the early stage of evolution, the space was full of these molecules (air): Vincent Kotwicki Dr., Journal of Hydrological Sciences (1991). 41 Sahih Al Bukhari Vol.5, 147 (1984). 42 Sahih Al Bukhari Vol.1, 213 (1984). 43 Sahih Muslim Bk.1, 213 (1994). 44 Gospel of Barnabas, 123 (?). 45 Gospel of Barnabas, 56 (?). 52 Sunan At Tirmidzi Bk. 5, 342 (1993). 57 Al Baihaqi; Translation of Imam As Sayuti, Ibnu Hajar Al Asqalani, Kisah Irak & Miraj Nabi Muhammad saw, 19-22 (2006).